Pets and Their Problems, A Guide for Animal Lovers deals with the ethics and problems of pet-keeping. The author discusses the craze for unusual pets and legislation that require exotic pet owners to have a license before owning or importing animals considered in a special group. The author also examines the sources of supply and the reason why people keep pets. He then discusses housing, temperature, sanitation, feeding, and nutritional needs. The author also describes in more detail the problem of difficult feeders—those normally healthy animals that do not feed readily such as when changes in cage accommodations occur or when they are bored with the same food over time. High on the list of the author's priority is pet companion and occupation (exercise, play). Another interesting subject the author discusses is individuality, not within the species, but as a pet with its own individual characteristics. The author notes that some experienced naturalists and zoologists are skeptical about marked individual "personalities" and behavioral characteristics of animals. 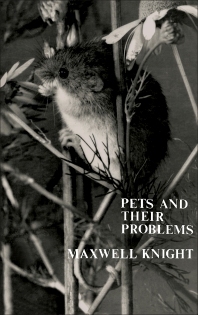 The author also provides some tips in caring for unusual pets such as monkeys, mongooses, and bush babies (galagos). This book can be helpful for pet owners, whether pet keeping is a hobby or a professional endeavor. It can be read by both beginning and established pet owners. Chapter II Why Keep Pets at All?